Mr. William Vergot is a graduate of Duquesne University with a Liberal Arts degree in Political Science and was in ROTC. He received a Regular Army Commission in the Artillery, served in Korea twice, Germany, Vietnam and in the Office of the Army Chief of Staff in the Pentagon when he was offered a job with the U.S. Steel Corporation. Bill has traveled extensively throughout the world and is currently retired. He was instrumental in establishing the Preserve Croatian Heritage Foundation in 2000; he is also the President of The National Federation of Croatian American Cultural Foundation headquartered in Washington D.C. Bill is ardent traveler. He is a former Tamburitzan, married (in St. Nicholas Church. N.S.) and blessed with three children and six grandchildren. Mrs. Jane Sestric is a Trustee and has served as the PCHF Recording Secretary for the last four years. She lives in Observatory Hill, near Riverview Park in the North Side, where she and her husband have raised four daughters. Jane works as an elementary school librarian and enjoys walking, reading, writing for her community newsletter and spending time with her two grandchildren. She and her husband have lived in North Side for more than 40 years and have been members of the St. Nicholas Parish, North Side for decades. Mrs. Susan Petrick is a PCHF Trustee and the PCHF Trustee and Corresponding Secretary since 2000 and became the Treasurer in 2015. She is also a member of the Croatian Fraternal Union, Lodge 1. Susan is a life-long parishioner of St. Nicholas Church, N.S. as well as her three children. She has been an art instructor for parochial school for the last 14 years and has 10 years experience as an account service manager for the Ketchum Advertising Agency. She is married, loves the fine arts, traveling and gardening. Mr. Jack Schmitt represents Preservation Pittsburgh’s Sacred Places Committee and sponsors a website at www.eyeonheritage.com on which St. Nicholas is highlighted. Jack has lived in Allegheny West, North Side restoring a home for 35 years and participates in neighborhood rejuvenation. He is a graduate of North Catholic High School (located on the hill above St. Nicholas Church. N.S.) and of Duquesne University. Jack has been instrumental, along with another preservationist, George White, in deriving PA Dept. of Transportation’s, Alternative 7 which spared St. Nicks Church and numerous retaining walls along Troy Hill — a plan that saved millons of taxpayers’ dollars. Jack also played a major role in PCHF’s partnership with the Northside Leadership Conference in 2008. Mr. William Kurtek is a graduate of the University of Pittsburgh with a degree in History and East European studies. Bill has traveled extensively and taught English in Slovakia. He is also active with his Church choir and enjoys gardening. Mrs. Bernice Goyak is a life-long member of St. Nicholas Church. N.S. and has celebrated all her sacraments there including marriage. 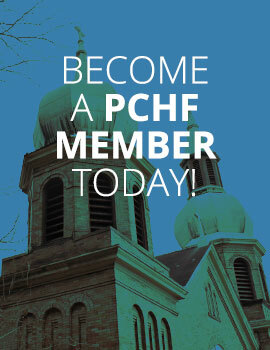 Bernice has been an active member of PCHF for the past 10 years and is responsible for handling PCHF’s bulk mailings. Mr. Steve Willing is a television News Photographer with over 30 years experience in the television business having worked behind the scenes on everything from documentaries to news. He works at KDKA-TV in Pittsburgh. His interests include: photography, traveling, history and architecture. He is a graduate of the University of Akron and resides in Edgewood. Steve is married and is the father of three children. Ms. Patricia Polaritz has been an active Board member for the past eight years and has served on several ad-hoc committees including PCHF bulk mailing. She is a life-long parishioner of St. Nicholas Church, N.S. Currently, Pat is retired from H. J. Heinz Company. Mr. Anthony Benvin is currently Chairman of Troy Hill Citizens, Inc. He is a graduate of the University of Pittsburgh (B.A.) and the State University of New York at Binghamton (M.A., Ph.D.). A former university professor, he has run his independent financial planning practice since 1989 and is a Certified Financial Planning® Practitioner.